It is hot outside! Almost too hot to cook. I have been going for easy meals (some of which are opening the refrigerator and letting everyone pick the leftover of their choice.) Even though it is hot outside (did I mention it is way to hot for May? ), I still love to have something yummy. This dessert is an excellent choice! It is super easy to put together and is delicious. The best thing about it is it doesn’t heat up your kitchen. So even if the weather at your house is not in the 90’s yet, put this recipe on your summer to-do list. You will thank me for it. 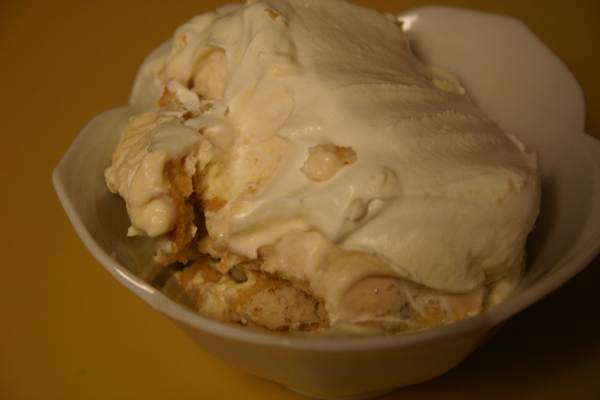 Banana pudding is definitely comfort food to me. Just the thought of it brings a smile to my face, and brings back fond childhood memories. If you were to make this recipe at my house you have to make sure all of the Nilla wafers are aligned correctly as well as the bananas. That’s just how things are here though. Our house is inhabited by a strange collection of perfectionists who demand even layers of all the ingredients. If the folks at your house aren’t perfectionists, then you may be able to put every thing together without taking all the time to make sure every space is filled properly. In our family, the ingredients have to be assembled with precision. Mix pudding mix with milk as directed on package adding vanilla. 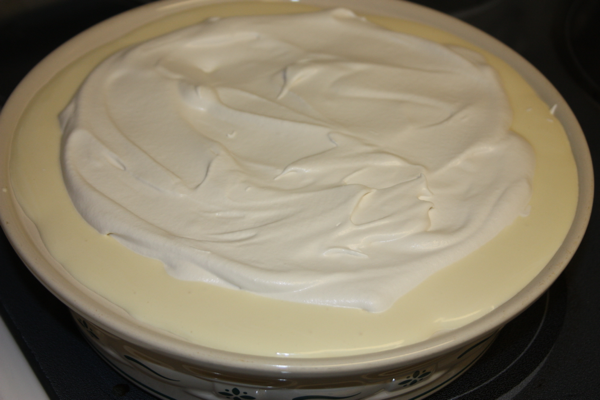 Add sour cream and cool whip (saving half for the topping). Whisk until everything is combined. 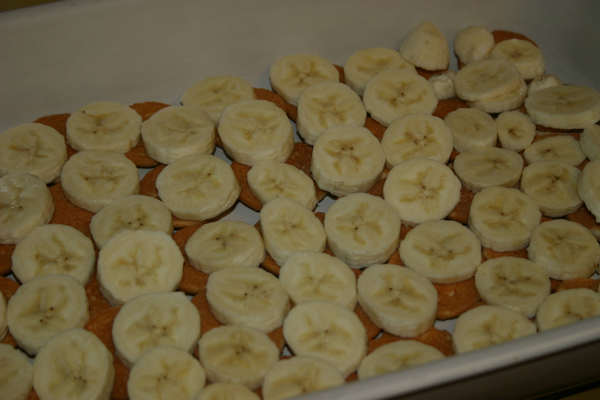 To assemble alternate layers of Nilla wafers, bananas, pudding mixture in a 9 by 13 baking dish. Repeat. 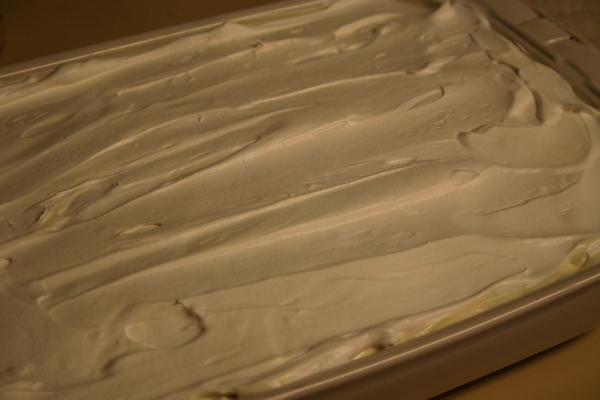 Top with reserved cool whip. Sprinkle with crumbled Nilla wafers for garnish if desired. Refrigerate until ready to serve. 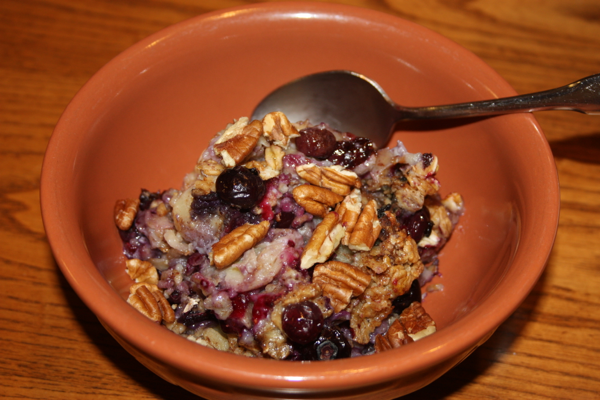 When the pan is full, be sure to take the picture quickly because this stuff won't last long! 2 Comments on "Mom’s Cold Banana Pudding"
sounds like what I made when MiMi was alive. she liked this recipe. love your site.